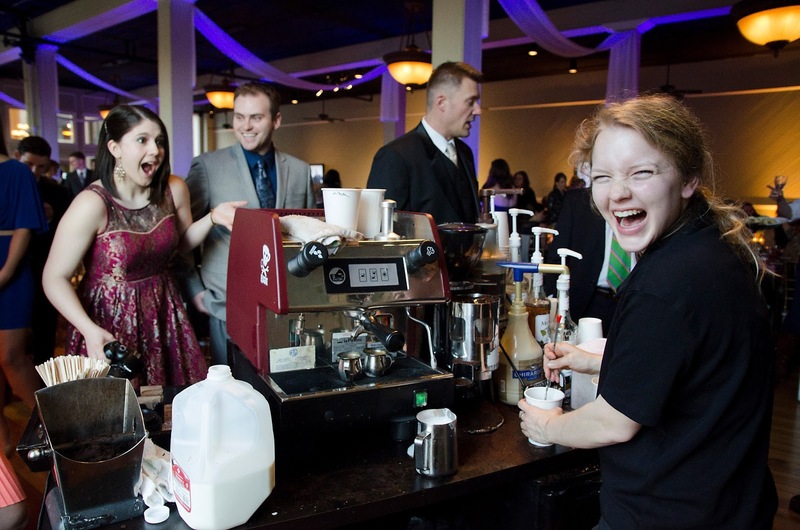 Twelve days ago, we had our second annual Barrister's Ball! If you remember this from last year, you know it's a fancy end-of-the-year occasion to dress up, eat a fancy dinner, hear a speaker and hang out with friends! It's mostly a night aimed at celebrating the 3Ls as they're about to graduate and head off into the world. Dusty had been in Chicago all week for the National Mediation Tournament, so he spent the majority of his birthday flying back to Lynchburg. He didn't fly in until that afternoon, so we didn't have much time to hang out and catch up before it was time to leave. But I did manage to prepare the apartment for his return! Plus, we spent the night having fun pretending that the entire event was in his honor. This year the ball was held downtown, rather than in the dining area above the football field on campus (which we actually really loved). This was the last Barrister's for many of our friends, so it was a lovely albeit bittersweet evening in honor of their time at Liberty. It was really beautifully done. It's kind of amazing how much effort they put into this event - we always tease that it's basically the women in charge playing make believe in planning their future wedding. The atmosphere of being downtown was great, being able to see all of the brick buildings and the James River outside the windows. We were seated with a bunch of fun people at a table called "Nuisance"! At check-in we got these name tags, attached to little keys. Dusty also received this engraved gavel via salad plate for being on SBA. In the back of the main dining area there was a set of stairs that led up to a really pretty space with large windows and little standing tables for hor d'oeuvres and such. It was a great spot to take pictures! For some reason I think downtown Lynchburg represents the spirit of my time here. The coffee shop White Hart was my first coffee date, and the farmer's market was one of my very first local experiences, and I soon fell completely in love with everything about downtown. It has its own unique history, complete with emptied out old brick warehouses (that Dusty and I like to pretend we can buy, and take turns imagining what we could do with them) and treasured little restaurants and expensive boutiques and great local flavor. I think I will always love Lynchburg, and when I think of some of my happiest moments here, many of them will be of downtown. Once we had finished checking out the upper level (we got there a bit late and missed most of the hor d'oeuvres - a definite note for next year! Get there early!) we went back down to the main party. My dinner, and my white chocolate raspberry mocha! One of the BEST things was the full-on espresso bar. It was "unlimited" (although they ran out of milk), and they were serving mochas and lattes. It was amazing. That may be one of my favorite pictures of all time, and mostly because it is a completely accurate portrayal of what went down. As usual, the night consisted of funny law jokes, a heartfelt video, food, candy, candlelight, various speeches and speakers and very important things. But mostly we just took pictures and looked cute. Honestly though, because we knew so many 3Ls this year, the entertainment was especially funny to us. A lot of the people that were featured in the "making fun of" feature (a guy went up and did some special law-school stand-up comedy, haha) we actually knew, and it was great to see how much fun everyone was having just reliving the past year and all the titles people had (like the guy who's always late, the "gunner" who asks too many questions, etc.). I'm not going to wax on about the importance of Greg and Allison to our little Lynchburg lives. It has been a topic carefully avoided in our household, save for the occasional breakdown. They're moving back to Illinois in May, and seeing as that is one month away, it's starting to become all too real and all too soon. Allison will be having her darling little girl in a matter of days, and their sweet family will be leaving us. I know how great it will be for them to find a cute house for their cute selves and have a cute life with cute kids and cute furniture and everything but I'm just angry. I would much rather them focus on having cute friends like us!! I know it's impossible to make all of our favorite people in the world move into a big complex in Arizona and have all of our kids grow up together, but it seems like a pretty great idea to me. We'll have to settle for being amazed, happy, grateful, and overwhelmed by the blessing they've been to us in our years here together. We will never forget these friendships. Nay, we shall not. What if her water broke right now!? I know that this next year is going to fly by, and before long, it will be our last Barrister's Ball and we will be flipping through our minds for all our favorite memories and be in complete shock that our time in law school is almost through. But for now, what's the rush? We cherish each and every moment, even the hard parts, even the sad goodbyes. Each moment is frozen in time through a picture or a funny story or great food or amazing friends. That's what these kind of nights mean to me.